For other uses, see Mousse (disambiguation). Chocolate, vanilla, strawberry, choco vanilla etc. 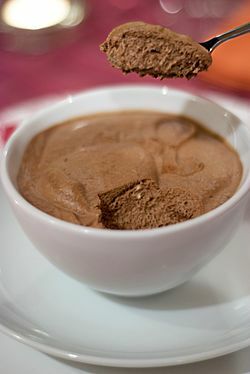 A mousse (French 'foam' /ˈmuːs/) is a soft prepared food that incorporates air bubbles to give it a light and airy texture. It can range from light and fluffy to creamy and thick, depending on preparation techniques. A mousse may be sweet or savory. Various desserts consisting of whipped cream in pyramidal shapes with coffee, liqueurs, chocolate, fruits, and so on either in the mixture or poured on top were called crème en mousse 'cream in a foam', crème mousseuse 'foamy cream', mousse 'foam', and so on, as early as 1768. Modern mousses are a continuation of this tradition. Look up mousse in Wiktionary, the free dictionary. ^ a b "Mousse". Food Network Food Encyclopedia. Retrieved February 21, 2017. ^ "Caramel & White Chocolate Mousse Recipe". VideoCulinary.com. Retrieved 2016-01-04. ^ "How to prepare Mousse". ^ Hyman, Gaston (1977). Hyman, Phillip; Hyman, Mary, eds. Lenôtre's Desserts and Pastries (1st ed.). Woodbury, New York: Barrons Educational Series Inc. p. 78. ISBN 978-0812051377. ^ "Paris Confidential: The Mystery Mousse Behind The Chocolate Bar". NPR.org. Retrieved 2017-10-05. Wikimedia Commons has media related to Chocolate mousse.